Pacific port in the Khabarovsk territory is one of Russia’s most important, handling cargo bound for Russia’s north-east, Japan, South Korea, China, Australia, the United States and other Pacific countries. Russian metals and mining giant Mechel has sold its controlling stake in the Pacific port of Vanino just a week after it closed a $508 million deal to buy the state’s stake in one of Russia’s leading ports, Mechel said on Monday. “In line with the conditions for the financing of the acquisition of 55 percent (73.33 percent of common shares) of Vanino Sea Trade Port's share capital, Mecheltrans [Mechel subsidiary] sold a part of the port’s common shares to Russian and foreign investors, retaining some 1.5 percent of the enterprise’s common shares,” Mechel said in a statement. Mechel won the tender for the Vanino port in early December, offering 15.5 billion roubles ($508 million) for the state package compared with the starting price of 1.5 billion roubles. Mechel CEO Yevgeny Mikhel later said the company had set up a consortium of Russian and foreign companies to participate in the tender but declined to specify the firms. If Mechel had retained the controlling package, it would have had to make a tender offer to the port’s minority shareholders, the largest of which is En+ Group owned by Russian billionaire Oleg Deripaska. En+ was one of the bidders for the state package. “Investors are not interested in transshipping their products through Port Vanino, which will enable Mechel to use the port’s entire capacity in the company’s interests,” Mechel said. Mechel previously said the Vanino deal was in line with the company’s strategy of developing its mining division in a bid to expand its export capacities and reduce transport costs in line with planned increases in coal mining volumes. Vanino is located in the Tatar Strait, between the Pacific Ocean’s Sea of Okhotsk and Sea of Japan. Vanino is the largest transport hub in the Khabarovsk Region and one of Russia’s ten largest ports. It handled some 6 million tons of cargo in 2012. Vanino handles cargo bound for Russia’s north-east, Japan, South Korea, China, Australia, the United States and other Pacific countries. Navigation at the port is open all year round. “Port Vanino has already begun shipping Mechel’s cargo. 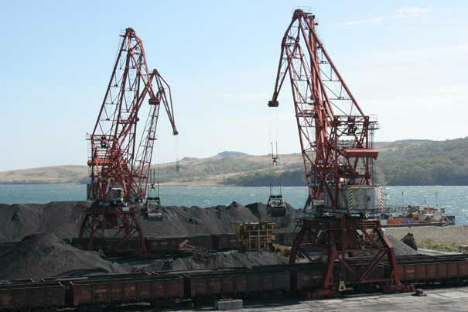 The first vessel carrying 30,000 tons of Yakutugol Holding Company’s coal products has left the port. Today another vessel, which will carry 40,000 tons of Yakutian coals, is being loaded at the port,” Mechel said.